Jane Clements Monday, who did not graduate from Sam Houston State but who has never let that stop her work on numerous SHSU endeavors, will be the university's summer commencement speaker Aug. 6. Some 750 students have applied for degrees to be awarded in ceremonies at 10 a.m. by the Colleges of Business Administration and Humanities & Social Sciences and 2 p.m. by the Colleges of Arts & Sciences, Criminal Justice, and Education. Monday will speak at both ceremonies in Johnson Coliseum. Monday, who was graduated from Huntsville High School in 1959, earned her Bachelor of Science Degree from the University of Texas in 1963, with teaching specializations in history and government. She worked as a teacher in Spring Branch, Texas City, Dallas and Houston. After moving to Huntsville she became active in community and university projects, serving as a Huntsville City Council member from 1979-85 and Huntsville mayor from 1985-91. She was appointed to Sam Houston State University's board of regents in 1991, serving six years including two as the board chairman in 1995-96. She was also a representative to the Texas Higher Education Coordinating board in 1994, 1995 and 1997. During those years on the board of regents she was on presidential selection committees for Angelo State and Sam Houston State Universities. She has also spoken at commencement exercises at Lamar Institute of Technology, the University of Texas College of Education, Lamar University at Orange, and Angelo State. She was the Texas Public Commissioner for the SHSU accrediting agency, the Southern Association of Colleges and Schools, from 2001-2004. Monday was on the University of Texas College of Education Advisory Council and received that college's Outstanding Alumni Award in 1991. In 1998 she was named one of the first seven recipients of the SHSU Alumni Association's Service Award, with special praise for her work toward creation of the General Sam Houston Folk Festival in 1987 and the General Sam Houston Bicentennial Birthday Celebration in 1993. 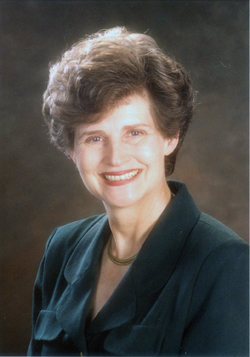 Her community work and offices include two years on the executive board of the Texas Historical Association (2004-06), membership in the Texas Philosophical Society (2003), participation in the Huntsville Walker County Chamber of Commerce Leadership Class in 1990 and holding the chamber's vice president position from 1997-99, and the Huntsville Rotary Club presidency in 1997-98. She is a founding member of the Huntsville Junior Service League, the Texas Prison Museum, and the Huntsville Book Review Club. That last activity is especially appropriate since she has concentrated on writing books on Texas history since 1991. Her first was "From Slave to Statesman: The Legacy of Joshua Houston," which she co-authored with Patricia Smith Prather. That book won the Violet Crown Award (1994) for non-fiction, the San Antonio Preservation Award (1994), and the Otis Lock Award (1995). Her book "Voices from the Wild Horse Desert," co-authored with Betty Colley, won the San Antonio Preservation Award in 1997. She and Colley also published "Tales of the Wild Horse Desert" in 2001. The latter two books both deal with the King and Kenedy Ranches of South Texas. Monday and her husband, Charles, have three children--Dr. Kimberly Monday, Julie Monday Ballard, and Jennifer Monday Goldman.